In 1661 King Charles II of England commissioned Sir Christopher Wren to create a series of microscopical studies. Wren obliged, but after a few presentations found he didn't have the time and gave up the project to an upcoming scientist with something of a knack for drawing and mechanics. The rest is history. Hooke's Drawing of his Microscope from Micrographia. Hooke viewed a thin cutting of cork and discovered empty spaces contained by walls which he termed cells. 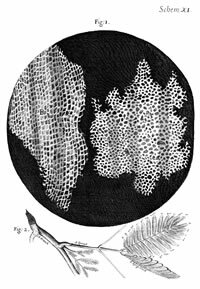 Hooke recorded all his drawings and observations into Micrographia: or Some Physiological Descriptions of Miniature Bodies Made by Magnifying Glasses. After acknowledging the King and the Royal Society, the book covered a wide range of topics from the construction of microscopes themselves, to the spectrum of color, the molecular causes of fire, the crystal structure of objects, and the anatomy of insects. Published in 1665, the book became an instant best seller. 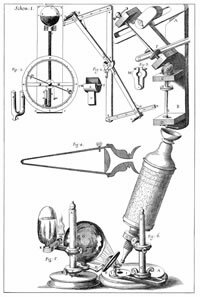 Hooke had ignited the spark of cell theory and set a trend of scientists making discoveries by looking through microscopes on government payroll. Publisher: MasParaSol Media Group Ltd.
Inwood, Stephen. The Forgotten Genuis: The Biography of Robert Hooke 1635-1703. San Francisco. MacAdam, 2003. Hooke, Robert C. Micrographia: or Some Physiological Descriptions of Miniature Bodies Made by Magnifying Glasses. London, England: Jo. Martyn, and Ja. Allestry, 1665.